VW camper vans are one of the coolest things to hit the road and van camping in a box on wheels gave a whole new dimension to the world of travel and camping. The VW camper world! They have been around since the 1950's, look just marvelous and tend to put a smile on your face wherever they go. For some reason these small campers won the hearts of many around the world. The modern day versions may lack the character of the earlier models but nevertheless successfully continue the story of a legend, as the Volkswagen van remains the favorite choice for small and middle sized camper van conversions throughout this magnificent planet. 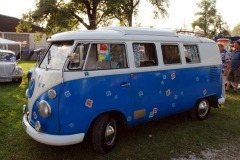 Based on the ever popular Volkswagen van, the first camper van conversion was done by a German company, Westfalia. 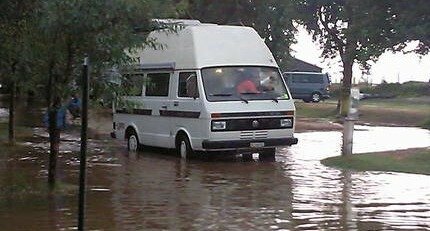 One of the first hand built prototypes was bought by Erna and Helmut Blenck, a couple of keen travelers who made an epic journey to South Africa in it and in 1955 published a book about their travel in a Westfalia camper van, South Africa Today. A few years later the first British company decided to introduce their own Volkswagen camper van conversion and so Devon campers was born. And guess what, converting vans became a profitable business for many others jumping on the same boat. With the arrival of VW camper vans a new era had begun which set the standard for the future of van campers and motorhomes. Nothing beats living out of your camper van. Having everything you need tucked inside and at the reach of your hand, you can stop whenever you want and decide when you'll go next watching the sunset. This is the magic of VW campers. Yes, these vintage campers are a bit slow and sometimes need your attention, but hey, that's just a part of the magical adventure! Today they are cult vehicles and symbolize fun, freedom and adventure. Can you think of any other camper van so widely popular around the world and frequently used in movies, music videos and other advertising ads? 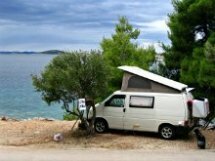 Share Your Volkswagen Camper Van Conversion with other visitors to this page using the form below! VW campers are usually the pride and joy of their owners, which are of course a special breed of people. They pay endless care and attention to their VW campers and can have an on going conversation about the most important thing in their life...yeah, you got it, their VW campers! Some people customize and paint them to achieve the look of their own. They create their own interiors just the way they like it. Others take on a full restoration project to restore the camper van to the original condition. And they all gather up in hundreds and thousands on special events, take their loved ones on camping trips, long adventure holidays or just simply travel the world. 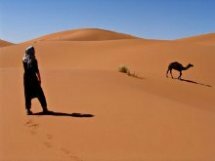 Epic journeys to Africa, Asia and South America included. Some folks just don't give up that easy! Being so popular has other advantages as well. 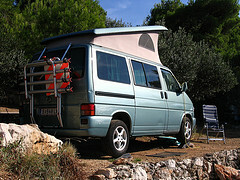 Magazines, books and forums cover VW campers around the world. A large selection of companies such as Go Westy or Just Kampers have just about anything you need to enjoy and keep your van alive. Anyway you look at VW camper vans I guess It's the down to earth simplicity, combined with the looks that put a cheerful smile on your face, multi purpose capability and high quality craftsmanship that made this camper van so popular. Wim from Belgium has also a lot to say about these buses so do check out his website. With the distinctive V shaped front panel and an air-cooled engine in the back, this was the first fully equipped Volkswagen camper van by Westfalia and definitely on the most "wanted" list among VW camper van collectors, reaching high price tags on the market when fully restored. 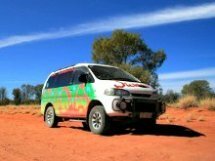 No way you'll pass unnoticed driving around this unique camper van! Note that the pop top roof was not available at this model. Some models have a small lifting hatch in the middle of the roof though for some headroom to change your clothes and cook your meals. This model replaced the Split in 1967. A more modern approach in design with a one piece windscreen which is a common sight even today. Compared to the Split, the van is comfortable to drive, handling is improved and the brakes finally work like brakes should. Air-cooled engine is still in the back, but has increased in power and size through time. Westfalia pop top roofs were installed, allowing standing height and additional two beds on the top so four people could sleep comfortably. Now, how cool can that be? Just stop wherever you want, pop the roof up, cook up a meal and enjoy the scenery! The van was produced in Brazil until 2013, and is available with modern water-cooled Volkswagen engines from 2005. 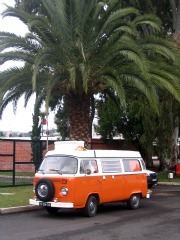 The Brazilian version is used by the British Danbury Motor Caravans for brand new and original VW camper vans. Pricey? Of course, but you get a brand new Volkswagen Camper! The T3 introduced in 1979 was the third generation of the VW Transporter, known as the T25 in the UK and the Vanagon in the U.S. and Canada. 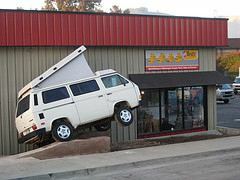 The box shaped van grew in width and length and made a perfect base for VW campers. 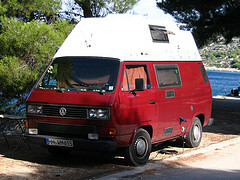 The camper van version in Europe was named the Joker and the California by the end of production. The back of the van still houses an air-cooled engine. Westfalia introduced the pop top roof and the high top roof with an extra bed neatly tucked away at the top allowing full-time standing room at last! Storage room largely improved with the high roof. The interior layout more or less set the standard for most VW camper vans today, with the kitchen cupboards and storage room running along the drivers side, the rear bench that converts into a double bed and the swiveling front seats creating a small, but comfy lounge with one or two swiveling tables. In 1982, the air-cooled engine went to history books and finally made way to a more modern water-cooled engine. Horror of all horrors for the air-cooled fans! A notoriously underpowered diesel engine was added at the time and shortly afterward received a boost from a Bosch turbocharger! With all the new plumbing VW camper vans finally received a proper fan-blown heater to keep the cabin nice and warm in the winter. Other car like amenities were available as well. The top of the line and the most capable VW camper ever made is the 4X4 Syncro, built by the Steyr-Daimler-Puch company. They are highly capable quality piece of machinery as the chassis was originally build for the German army. Now you can imagine how tough that is! After 41 years Volkswagen finally broke the tradition of keeping the engine in the back and in 1990 launched the T4 Transporter or the Eurovan for the U.S. market, the fourth generation with a water-cooled engine in the front. Westfalia kept the California name for the VW camper van world. A huge storage room is now the back and with new interior designs, this is just what a proper camper van needs. With the new line of powerful diesel and petrol engines and overall superb handling this camper vans were a huge step forward from the previous models. The T4 is still a solid base for many camper van conversions today and available in 4x4 edition named the Syncro. In 2003 the fifth generation or the VW T5 was introduced to the world and for some reason not to the US market. Very similar, a bit larger and arguably better then the previous model. Volkswagen terminated its special relationship with Westfalia and for the first time produced their own camper van conversion, the California. An evolution of the interior, using a high quality minimalistic design, with a power-driven pop top roof. Wow! 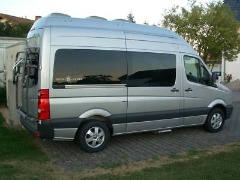 A long list of companies such as Bilbos, Autosleeper and Reimo use the VW T5 for their camper van conversions today. And if you understand German, the SpaceCamper is a young conversion company from Germany packed with all kinds of new solutions. Despite the fact that the world of VW camper vans mostly spins around small camper vans, there is a larger model in the background. The Volkswagen LT panel van is a lightweight commercial vehicle, larger than the smaller buses, therefore a lot room is available for a camper van conversion. The first generation was produced from 1975 until 1996. In the same year Volkswagen teamed up with Mercedes Benz and came up with the second generation of the LT van. Sharing the same body shell, both companies otherwise used their own chassis, engines and other vital parts that make a van move. The production ended in 2006 and continues with a new model and a new name. The Crafter, but more on that later on. 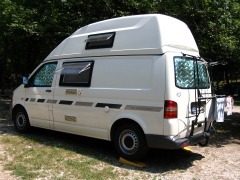 With the LT conversion, VW camper vans stepped in the world of larger campers. Westfalia was again ahead of everybody else in this niche and introduced the double room concept, which is basically still used in modern day camper vans. So, the kitchen and the shower/toilet cabin are all the way in the back while the sleeping area is up front, using the folding seats as the bottom bed and the elevating bed is in the high top hard roof. 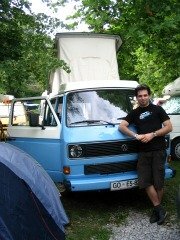 A lot of homemade camper van conversions are build using both generations of the LT. Both generations of the LT are still seen on the roads of Europe in large numbers, only to prove the quality of these evergreen camper van conversions. And just a tip. If you're looking for the first generation of these camper vans, consider buying the 6 cylinder engine model! The new generation of the LT is called the Crafter. The joint venture with Mercedes Benz continues by sharing the same shell and using different components otherwise. 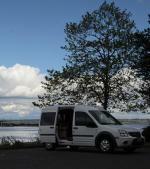 The van is also known as the Dodge Sprinter for the American public. The van is otherwise sharing many similar components with the smaller T5 model, engines included. 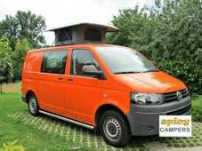 The body is used by various camper van conversion companies around the world and a lot of homemade VW camper vans grew up on this new model. Light years away from the simple and practical solutions of the early Splits and Bay windows, these VW camper vans are packed with modern technology, cockpits that would make any regular car owner blush, lots of room, great handling and far better gas milage even though they are larger and better equipped in all aspects. They will be great workhorses in the years and decades to come like my T4/Eurovan for example, but they will never reach and touch history like the early models. A 60 year tradition is hard to beat in any business today and based on the quality and versatility of the Volkswagen van, any camper van conversion will offer you many memorable adventures to come! Recently Westfalia started using Volkswagen vans once again, so keep your eye on the hot new models coming out! 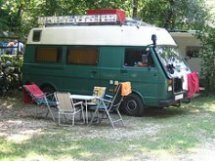 Well some people use the Westfalia campers and other campers to pull of the grid and just enjoy the magic of their life by living in a van. Others simply enjoy rebuilding an old van using used camper parts. And you can all share your homemade projects on the van campers page. Are You A Proud Owner Of A VW Camper Van? VW camper vans are usually the owners pride and joy, no matter how old or what type they are. Many of them are personalized with bright color schemes and "comfy interiors", while others keep the original condition or something close to it. 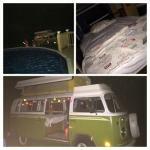 So if you have a VW camper van of any type, I'd love to hear from you! And Volkswagen camper folks around the world always love to read something new and exciting. Click here to see the rest of the form and complete your VW camper van review.